Reactions at the alpha carbonyl position with enolate intermediates occur in many reactions! This includes but is not limited to: Alpha-Halogenation, Haloform & Idoform tests, Aldol, Claisen Condensation and more. 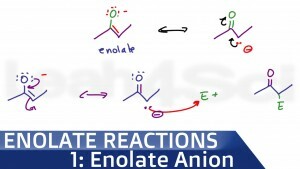 Once you grasp enolate anion formation, it’s reactivity and stability, you’ll have the clarity you need to master the upcoming reactions. This video also covers common enolate pKa values, with a logical stability ranking to help you avoid pKa memorizations. This is video 1 in the Enolates and Reactions at the Alpha Carbon Series. Click for complete series.